When you’re writing a character, it’s important to know why she is the way she is. Knowing her backstory is important to achieving this end, and one of the most impactful pieces of a character’s backstory is her emotional wound. This negative experience from the past is so intense that a character will go to great lengths to avoid experiencing that kind of pain and negative emotion again. As a result, certain behaviors, beliefs, and character traits will emerge. Characters, like real people, are unique, and will respond to wounding events differently. The vast array of possible emotional wounds combined with each character’s personality gives you many options in terms of how your character will turn out. With the right amount of exploration, you should be able to come up with a character whose past appropriately affects her present, resulting in a realistic character that will ring true with readers. Understanding what wounds a protagonist bears will also help you plot out her arc, creating a compelling journey of change that will satisfy readers. NOTE: We realize that sometimes a wound we profile may have personal meaning, stirring up the past for some of our readers. It is not our intent to create emotional turmoil. Please know that we research each wounding topic carefully to treat it with the utmost respect. We hope the sample list of ideas below will help you see how emotional trauma will influence your character’s behavior and mindset. For the full entry of this and over 100 other emotional wounds, check into our bestselling resource, The Emotional Wound Thesaurus: A Writer’s Guide to Character Expression. I’m not safe; I always have to be looking over my shoulder. People will only see me as a convict. TIP: If you need help understanding the impact of these factors, please read our introductory post on the Emotional Wound Thesaurus. For our current list of Emotional Wound Entries, go here. For other Descriptive Thesaurus Collections, go here. Which emotional wounds are haunting your characters and keeping them from being whole and fulfilled? Emotional wounds are incredibly formative, changing how a character views the world, causing trust issues, damaging their self-worth, dictating how they will interact with other people, and making it harder for them to achieve their goals. As such, understanding your character’s wound is vitally important to your overall story. To help with this, we have integrated this thesaurus into our online library at One Stop For Writers. Each entry has been enhanced and expanded to provide even more helpful information about your character’s wounds and is cross-referenced with our other thesauruses for easy searchability. We’ve also included a must-see tutorial on this topic—a crash-course on how a wound impacts the affected character and the role wounds play in his or her arc over the course of a story. Interested in seeing a sampling of our completed wound thesaurus entries? Head on over and register for free! On the other hand, if you prefer your references in book form, we’ve got you covered, too, because this thesaurus is now available for purchase in both digital and print form. In addition to the 120+ entries, each book contains instructional front matter to help you understand wounds and how they’ll affect your character and story. 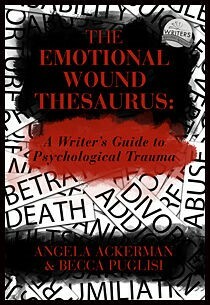 With chapters about the wound’s aftereffects and how the event ties in to the character arc, along with ideas on brainstorming your character’s wound and how to best reveal the trauma to readers, this book will be your go-to resource for connecting the backstory dots and coming up with characters who are well-rounded and realistic. Please, please do a follow-up piece on the emotional woundsthat may result from being sent to jail for something not done and for a crime totally inimical to the motivation of the victim. Soon. Thanks for the article. A novel I started last year features a 48-year old who was released from prison after new DNA showed another committed the murder. Your list will be pinned up above my screen. Thank you. This was really good, as my novel starts out with my main character suffering from many of these side effects. His incarceration was due to an accidental homicide, but has left him with much trauma. Much of my story is how he learns to overcome his time in prison, and finds the great person he used to be, once again. Thanks for this, Becca!! So glad it was timely, Judith. I’ve had in mind to do another entry on being unjustly convicted of a crime, since that adds another layer to someone being incarcerated. I may do that one as a follow up in a few weeks :). I’d like to add a few items to your helpful post on incarceration. For many mothers, the guilt is devastating and often covered up with negative traits of overcompensation and grandiosity about the future. There is also a lot of depression, guilt, and powerlessness over incarceration and life. The fear of vulnerability and trust is also prevalent. Thanks for chiming in, Mona. As with all wounds, there are so many different angles, different fears and habits that will crop up depending on the person. I can see how the guilt and fear of vulnerability and trust could definitely come into play. Thanks! This entry will be very helpful in my next novel.